Another Pokemon demo hits the 3DS eShop, another massive leak: thanks to the efforts of Pokemon Sun and Moon demo dataminers we now know what the final evolutions of the full game's starter Pokemon will look like - not to mention all the rest. Before we proceed, be warned: you are about to read big spoilers for Pokemon Sun and Moon. If you'd rather discover all these new creatures for yourself, or meet them as part of The Pokemon Company's carefully crafted hype cycle, do not scroll past this charismatic pug. Alright, the pug says you're in! 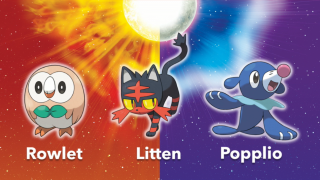 Here are the ultimate forms of Litten, Popplio, and Rowlet (here are their middle forms). Apparently Game Freak managed to wipe out the names from the demo's files so we don't know what they're called yet, not to mention what types they are or moves they have. You can watch this quick YouTube series if you want a more thorough rundown of the data miners' findings, or you can skip straight to this Imgur gallery to see (almost) every last sprite. It looks like there are less than 100 new Pokemon total, though the Alolan variants of existing Pokemon are sort of new themselves. Check this Imgur gallery for all of them. Just remember that none will ever be as perfect as the crab that turns into a yeti… crab.